In a borderless world, practitioners have an opportunity to market real estate to the region and beyond. The Malaysian Institute of Estate Agents (MIEA) is the official body that represents real estate agents in Malaysia. For more than 10 years now, MIEA has been organising high quality conventions not just for its members, but also for the public at large. For the upcoming MAREC 09, MIEA is organising a convention with a difference. With the growing financial and economic uncertainty across the globe, MIEA feels that now is the time for practitioners to look within themselves and re-brand the profession. The time is now right for practitioners to embrace the latest marketing methods, unique selling propositions and in the process, create a highly specialised and niche market for themselves. Aptly themed “Reinventing the Profession”, MAREC 09 promises to be a convention that would prepare practitioners to better weather the financial storm ahead. Simply, it is a convention “for the practitioners, by the practitioners”. The topics at MAREC 09 deal with everyday issues faced by estate agents. Most of the topics will be delivered by practising estate agents who have achieved success in their career. As such, those attending the MAREC 09 can be assured of not just quality topics but presenters and panellists who are themselves practitioners and are up-to-date with current issues affecting real estate agents and the profession itself. As the market becomes more and more sophisticated and the world continues its unrelenting pace of globalisation, running a real estate agency is no longer the task it was yesterday. This module attempts to bring the participants skills they will need to cultivate to successfully manage a real estate firm. Practitioners will be taught modern methods of setting goals and applying their mind as well as daily activities to achieve that goal. As the global economy starts diving into a tailspin in a reaction to the financial crisis in the United States, hard times are expected to hit our shores again. How do we anticipate what is going to happen? How do we prepare for it? How long is it expected to last? How can practitioners brace themselves during these trying times? These and other questions will be answered and the way forward outlined. In today’s increasing sophisticated markets, gone are the tried and tested marketing methods that have been the trademark of estate agencies for years. If real estate agents are not willing to reinvent themselves and the way they reach their customers, they will be left behind as dinosaurs in the industry. This module will attempt to introduce participants to modern marketing tools and methods. It will guide them in embracing these new tools and technologies to enhance their business as well as their professional image. The world is becoming borderless. International boundaries are disappearing from day to day while the financial markets of the world move seamlessly from country to country, region to region and continent to continent. International travel has become a way of life for many people. As they travel, they become more aware of opportunities that present themselves. In this scenario, practitioners have an enormous opportunity to market legal real estate to the region and beyond. The aim here is to provide participants with insight on exactly how they can go about doing this. In recent years, there have been several significant amendments to legislation that affect land matters. This module will highlight these amendments and equip participants with knowledge on their workings and implications. Interested to register for the convention? Between now and January 31, early bird discounts are offered for both members and non-members, so hurry up and take advantage of these promotions! Sign up now for the Malaysian Real Estate Convention – MAREC 09 to be held on February 14 & 15. For further details, please contact MIEA. PROPERTY developer SP Setia Bhd (8664) reported weaker fourth quarter and full-year results for fiscal 2008 as higher costs of fuel and materials eroded profits. It also missed its full-year sales target of RM1.5 billion, reporting a revenue of RM1.3 billion. "We expect to maintain the group's performance next year by launching a product mix targeted at niche markets according to their need," group managing director and chief executive officer Tan Sri Liew Kee Sin said after announcing the results in Kuala Lumpur yesterday. SP Setia's fourth quarter net profit fell 24 per cent to RM76 million due to disruption of work in progress led by fuel and energy price increases. Revenue for the quarter was RM420.8 million, a 33 per cent jump from RM317.2 million previously. The group's sales were mainly derived from its property development activities in Setia Alam and Setia Eco Park in Shah Alam; Bukit Indah, Setia Indah, Setia Tropika and Setia Eco Gardens in Johor Baru; and Setia Pearls Island in Penang. SP Setia has 16 ongoing projects with a combined gross development value of RM30 billion. Its total undeveloped landbank stands at 1,959ha, inclusive of 223ha in Vietnam. For the full year to October 31 2008, SP Setia posted net profit of RM213.5 million, 18 per cent lower than what it made in 2007. Revenue was up 15 per cent to RM1.33 billion. It has proposed a total dividend payout of 17 sen per share. 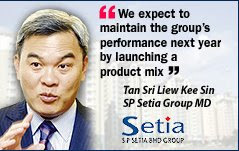 Since SP Setia has already launched all its major townships complete with infrastructure, school, hypermarket and other amenities, it will now develop dedica-ted products driven by consumer demand. "We are also beginning to see construction prices trending down, beginning with the decrease in steel bar prices. We will continue to develop products that suit house buyers' changing lifestyle and affordability," said Liew. With a net gearing of 0.19 time and some RM593 million cash in hand, SP Setia will continue to look for suitable land in the three states it has already carved its Setia brand. Commenting on its first overseas venture in Vietnam, Liew said the company hopes to launch the township by the second quarter of next year. SP Setia has clinched a deal to jointly build a 32ha mixed development in Ho Chi Minh City catering for expatriates and senior staff working in the Saigon Hi-Tech Park. KUALA LUMPUR: SP Setia Bhd is embarking on a flexible three-pronged business model based on cash conservation and generation as it gears up for a challenging year. The first stage would see it focusing on the middle-income segment locally, which is underpinned by relative job security, supportive demographics and high household savings, the developer said yesterday. The second part of its strategy will see the company planning marketing strategies and events that are effective and cost-efficient. The third prong will see SP Setia undertaking judicious implementation of its development plans. The focus will be on projects that has the least hurdles to take-up rates, the quickest turnaround period and which increase the value of the surrounding area. SP Setia said the model would enable it to continue to fund its operations, invest in longer-term, yield-accretive projects as well as allowing it to grab good opportunities that might come during these uncertain times. Group managing director Tan Sri Liew Kee Sin said the company was well-placed to ride out the storm due to its diverse range of strategically-located properties ranging from affordable to mid and high-end segments. “Our experience during the Asian financial crisis (of 1997/98) and other downturns over the past 10 years has shown that the middle-market segments in Malaysia is very robust,” he said at a press conference to announce its earnings for the financial year ended Oct 31, 2008. With almost 80% of its land bank in Malaysia under the Setia brand, Liew said the company could easily re-focus on its forte of township development and develop affordable products to suit current market demand. SP Setia, he said, had a strong balance sheet with RM593mil cash and net gearing of 0.19 times. SP Setia posted a net profit of RM76.08mil for the fourth quarter ended Oct 31 compared with RM99.78mil a year earlier. Revenue was at RM420.75mil compared with RM317.16mil previously. It proposed a 10 sen dividend per share. For the financial year ended Oct 31, it posted a net profit of RM213.46mil compared with RM260.07mil a year ago. Revenue was higher at RM1.33bil compared with RM1.15bil. SP Setia said the drop in profit in FY08 was attributed to lower gross margins and general overheads, as well as marketing expenses. But despite the trying times and perceived soft market sentiment, total group sales were higher, Liew noted. “This reflects our ability to successfully capture housebuyers’ changing lifestyle needs and aspirations,” he said. Liew said SP Setia’s profit and revenue were derived from property development in key projects such as Setia Alam and Setia Eco Park. The group has 10 active projects and 3,975 acres of undeveloped land bank with a gross development value of RM16.5bil. PETALING JAYA: The developer of the Damansara 21 hillside project in Medan Damansara needs six more months to complete soil stabilisation works to guarantee the safety of the hill. Selangor Dredging Bhd (SDB) managing director Teh Lip Kim said it was imperative that work to stabilise and strengthen the slope continue. “We have spent about RM30mil so far to strengthen the slope because we want to make sure the houses and the surrounding areas are safe,” she added. Teh explained that the stabilising works included placing 282 pilings along the back of the hill without using machines. Anchors were also driven into the base of the hill. Group general manager Loong Ching Hong said the portion of the slope between the middle and top of the hill would be removed and the 21 bungalows built on flat ground. “The bungalows will effectively be built on terraces,” he said, adding that SDB would never compromise on the safety or lives of housebuyers or those in neighbouring areas. SDB had acquired the land, which came with a development order, from MAA in 2005. Loong said it was the terrace design, which received support from 16 government agencies, that led to SDB’s amended development order being approved. On the stop-work order and RM100,000 fine slapped on SDB in April, Loong said the stop-work order, which actually had delayed soil stabilisation works, was lifted in October. Loong said the plan then was to continue soil stabilisation works at the base of the hill. He added that SDB had received verbal agreement from City Hall to use the access road that cuts through the residential area so that the work could be sped up. Loong said this meant they could no longer touch the site, and what they had feared most – a landslip – occurred. Teh said SDB had not even launched the Damansara 21 project and yet was spending money to make the hill safe. JOHOR BARU: Aeon Co (M) Bhd remains bullish on Malaysia’s retail industry despite the gloomy global economic outlook, says chairman Datuk Abdullah Mohd Yusof, adding that the industry was valued at about RM70bil annually. Managing director Nagahisa Oyama said apart from Klang Valley and Penang, the company was focusing on Johor Baru as part of its mid-term plan until 2010 for future expansion. With South Johor being developed into a retail hub, Iskandar Malaysia offered good business prospects for retailers, he said. He said over five years, Aeon had opened four shopping centres within Iskandar Malaysia at Taman Universiti, Permas Jaya, Tebrau and Bukit Indah. “We believe the retail sector in Iskandar Malaysia will continue to grow in years to come in tandem with the growth of the corridor,’’ Oyama said at the tree planting ceremony to mark the opening of Aeon’s Bukit Indah shopping centre last Saturday. The RM300mil shopping centre on 15.132ha is Aeon’s 21st Jusco store. To date, 95% of the three-storey shopping centre has been taken up by 200 tenants. Oyama said the shopping centre would open for business on Dec 19 in time for Christmas while the grand opening would probably be early next year. Meanwhile, Johor Mentri Besar Datuk Abdul Ghani Othman said many local and foreign retailers would be opening in Iskandar Malaysia be it shopping complexes, hypermarkets or supermarkets. He said a world renowned property group would open a premium outlet in Iskandar Malaysia soon, making it the first premium outlet in South-East Asia. Ghani said the outlet would also attract shoppers from this region as similar outlets had proved popular in cities like London, Tokyo, New York and Seoul.